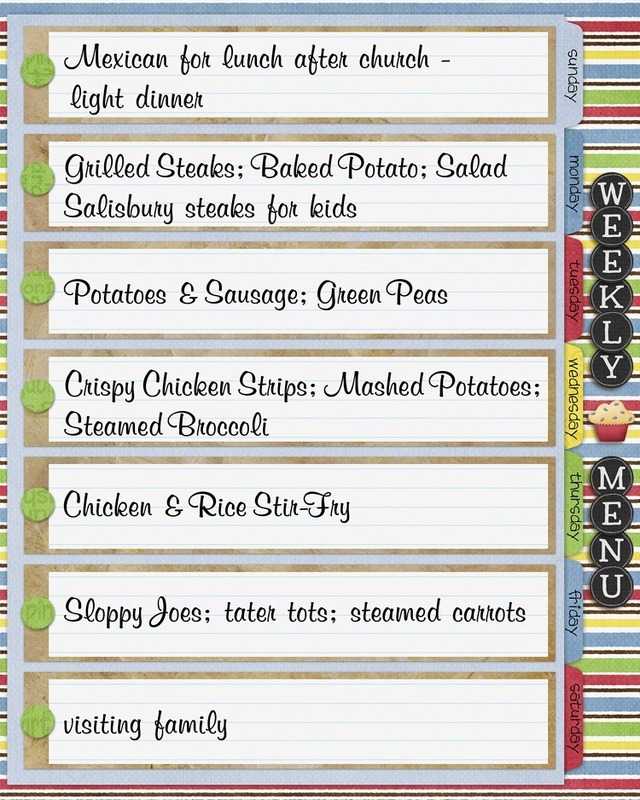 Planning meals for the week does not have to be complicated. This may seem unlikely when trying to concentrate, all the while hearing pets scurrying around the house or children asking for this and that or squabbling with each other. Even if you only find a few minutes of calm, take a quick look over your week ahead before planning the trip to the grocery store and you’ll be glad you did. Which nights will there be events — soccer practice, baseball practice, dance class, teacher meeting, birthday party, dinner with friends, and so forth? This will help you decide which nights will have a little more time for preparing dinner and which ones will be the most harried and difficult to get dinner on the table. For the nights with less time for preparing dinner, plan a meal you can put on in the crockpot that morning (after preparing ingredients the night before, if you’re headed to work that day); then quickly throw on some frozen veggies to cook with it or toss a salad together in time to serve everyone before heading off to that evening’s event. 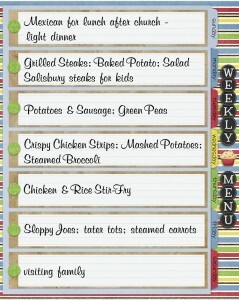 Some great crockpot meals include the Slow Cooker Steak Fajitas, Beef with Broccoli, or Crockpot BBQ Chicken. Certain nights will work great for preparing something on the grill (such as this <strongGrilled Tilapia), while for others because of late arrivals for dinner or expecting to wait on someone’s work or school schedule, it would be easier to prepare something that can be held over and kept warm for a while to allow everyone the chance to eat a delicious home cooked meal – like Baked Ziti or Mostaccioli. Also take a quick look at local grocery ads to see what types of meats and produce are on sale that week. This is a terrific way to save money weekly, planning your meals around the foods that you can get fresh at the most reasonable price. Plan one night a week, if possible, for a fun family meal everyone can help with — something like home made pizzas or fill-your-own burritos; this can be a fun evening of playing games or watching a movie and enjoying both preparing and eating dinner together. 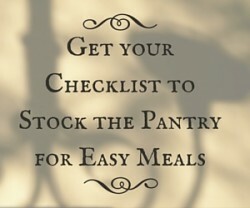 Once your list of meals is in place for the week, putting together the grocery shopping list will be much simpler (and you will save time and money knowing what needs to be purchased without spending money on extras or food that will be wasted). 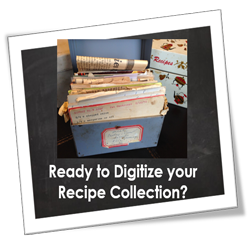 For the recipes here in your digital cookbook on Dish Dish, (with your free account) you can pull up the recipes for that week, one-click on the “Add to Shopping List” and pull that list together even more quickly; then simply pull up your shopping list page and add any other items you need to purchase that week. Your shopping list will be with you on your mobile device whenever you are ready for your trip to the grocery store. Remember to grab your coupons before you go, too, for even more money saving opportunities. 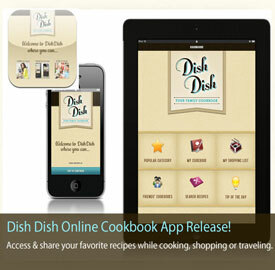 Or grab our app to keep track of your grocery list even more easily on your iPad or iPhone.